Emma Twyford is this month's front-cover star of both Climber and Summit magazines, and this double-display of publicity is very well deserved. Emma has just had one of the best trad seasons of any UK climber, and she's also been pushing the limits of UK women's sport climbing. Quite a year Emma. What has been the highlight for you and why? In a weird way, although I've not succeeded on it yet, Big Bang (9a at Pen Trywn) has been the highlight in terms of making it through the hardest crux moves and then falling trying to rock onto the top slab five moves from glory. Although it is frustrating, that excitement at knowing a route is possible, that’s also challenging and at your limit. is hard to beat. I've never had a route challenge me so mentally and physically at the same time. The more obvious highlight of success would be Big Issue (E9 6c), in Pembroke. This was my more realistic and achievable dream route of the year, but one that still pushed me. Did you have any near misses on any of the routes like some of your friends may have had; I remember a 'moment' occurring when you were on the lead on Impact day (E8 on Pavey Ark) for instance? It was a funny one on Impact Day, I was cautious because of what had happened to Hazel but I also think having a healthy respect for the dangers of a route is sensible. Perhaps in this case I was over cautious and I shouldn't have been but you have to weigh up the risks and be happy with the decision you make. I would never have started the route if I didn’t think I could climb it. I've had near misses when I was younger but nothing where I have fallen off a route and had minor injuries or decked out. I have learned over the years of these near miss lessons when I'm in the right place to go for dangerous routes. Even though the dangerous part of Nightmayer was wet this year I was ready and it ended up being fine. I've learned to listen to my head if I'm not feeling it, even on easier stuff. There is no point in setting yourself backwards just for the sake of your ego. You've lived in Wales, the Lakes and Sheffield. All big climbing areas, what have been your favourite days in each place? That’s a toughie! There are too many to choose from really! The Lakes will always have many special memories for me as it is where I first learned to climb with dad and his friends and also yourself (thanks Em). I think one of my most memorable in recent times would be camping and climbing on Scafell, climbing Lost Horizons, but the whole week was a top reminder of how great the Lakes is. Sheffield was a funny one for me; I lost my climbing psyche a little and ended up going out a lot. But my days out with Sheffield Hallam climbing club were great fun! Again there have been so many great days in North Wales that it is hard to pick one. My days out bouldering when I first moved to Wales were amongst some of my favourite as it was a fantastic winter intro with a great bunch of psyched people. One of my favourites though has to be climbing Graduation Ceremony at Gogarth with Dave Evans; you can never go wrong with that combination. I've climbed with you since 1997 and it seems that this year your motivation for doing hard routes has been at an all-time high. Can you pin this down to anything in particular. Spinach, meditation, religion, that kind of thing? I spent a lot of the last three years injured from a car crash on the M56 so this was the first year where I felt I could actually start pushing it again. I think I just started to feel confident in my climbing ability for the first time in ages and happy to try hard. In general I'm also the happiest I've been in a long time in myself, and that translates into my climbing: I'm more willing to put myself out there and fail. So this year I set myself bigger goals and challenges knowing that I may not succeed but being ok with that possibility. I made more time for breaks from setting this year too and decided to start the year with a trip to Spain which helped with psyche and momentum for the year though training still suffers when I'm setting. I also started to cut out dairy this year due to issues of eczema which made a bit of a difference but it also meant my weight stopped fluctuating and I started to feel better on a daily basis. My overall incentive though has just been to have a year where I can burn you off while you are partying! What do you make of the climbing scene in North Wales at the moment? The climbing scene in North Wales is great. There is a real diversity in what folks are psyched for. There are new routes going up, the trad scene feels like it is alive and kicking with some hard headpoints going down on a weekly basis. 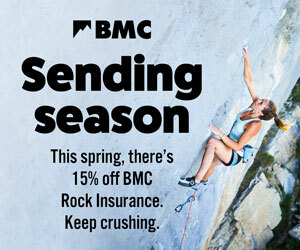 The sport climbing scene has been a little quiet but the girls’ bouldering scene has been the best I've ever experienced thanks to a bunch of psyched ladies. You've been getting close to redpointing Wales' hardest sport route, the Big Bang. What’s drawn you to this climb? How does it compare to other hard sport routes you've done and have you had to change your approach at all? I think in the first place I just wanted to check it out, I can’t really explain why it drew me in to start with except the fact I thought the style could suit me. I knew it would be hard but I was keen to have a project that I could figure out and that was close to home. It suits my style but it’s still really freaking hard, this route feels like it’s been pushing my limits both mentally and physically. When I climbed Mind Control earlier this year it felt easy in comparison, it wasn’t much of a fight. This feels like a big step up, I've worked hard at it and have got close but no cigar. The conditions are so fickle at LPT; I've been very meticulous at checking the best days to go down but didn’t foresee the very hot summer which threw me a little in being able to try it consistently. I've maintained a normal lifestyle although I've cut out going partying but everything else has been fairly balanced. I want it to be a healthy and enjoyable process where I can maintain the energy for trying it. What’s on the trad radar for next year and why? Mission Impossible (an E9 in Ogwen, North Wales) if its stays dry and not too midgy. I'd love to get this one ticked off as it’s very physical but safe. When I had a brief look it seemed that the moves were great but it was wet and horribly midgy. The Longhope direct on Hoy, the hardest sea cliff in the UK, I think the seed was planted by you again. It looks like a mega adventure if I can get a team together. I'd like to scope out the possibility of some new routes, it would be cool to find an aesthetic line and figure out a sequence, clean it and leave my own mark of something I can be proud of. But I'm also fairly open to ideas and suggestions so I'm pretty sure my list of routes will evolve and grow once I sit down. I need to go back to onsighting routes at some point too; some adventurous days out at Gogarth might be much needed. What are your five favourite climbs of North Wales, trad, bloc or sport? 1. Statement of Youth (8a), my first UK 8a flash at this grade. 2. Graduation Ceremony (E4 6a), slightly less climbed than other classics but one of my favourite Gogarth experiences with Dave Evans. 3. Lord of the Flies (E6 6a) super classic Cromlech test-piece and my favourite one up there. 4. Down on an Elephant (V8+), a superb location by Llyn Gwynant. 5. Strawberries (E7 6b), classic sandbag but safe as houses at Tremadog. I have to ask! If we are climbing together next year and I deck out, will you: A. Help or: B. Meditate and blame my karma? Well I would probably help you first and make sure you were alright before relentlessly taking the piss out of you and your karma. Obviously if it was serious I'd wait until you were fully recovered before taking the piss. If you go to the Works party this year do you envisage your dance moves as having your arms mainly above or below shoulder height? Well that entirely depends on a few factors.....I'd say about mid height, don’t want to end up with knackered or tired shoulders. Reckon I'd get pumped if they were above my head all night. To be fair I'll follow your dance moves, I've heard on the grapevine you’re the guru of partying hard this year. Thanks for the answers Emma and good luck, but don’t believe everything you hear on the grapevine! Interview by James McHaffie, BMC youth and equity officer. You can follow Caff on Instagram here. Follow Emma on Instagram here.